Yesterday's article was long on words, so today we're going to focus more on charts. There's been no material change in the outlook, since so far the market hasn't done anything even vaguely unexpected, but I've refined a few charts and potential targets. The first chart I'd like to share is one of my proprietary signal indicators. While I'm not publishing all the constituents which actually make up this indicator, I have noted the prior few years of signals on the S&P 500 (SPX) chart below. This is one of the signals which is presently keeping me in favor of the bears for another leg down. Note the present similarities to the examples of 2011 where two sell signals fired off in close succession. Today, we're going to start off with the one-minute chart and build from there. 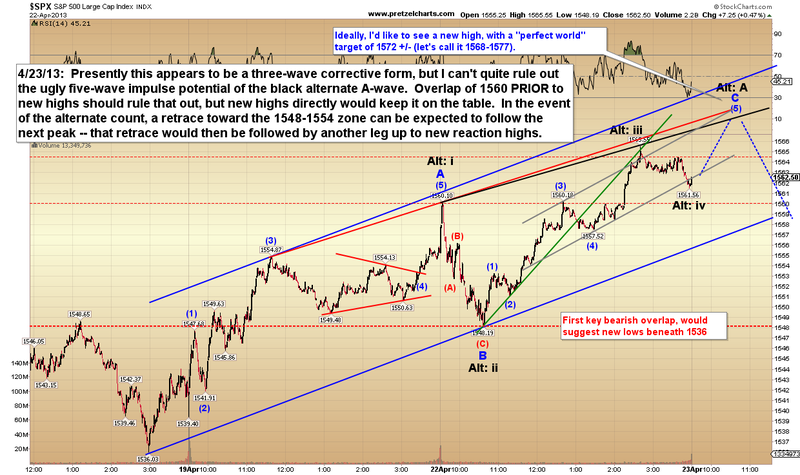 One of the challenges in market prediction is the anticipation of how a corrective wave will unfold. 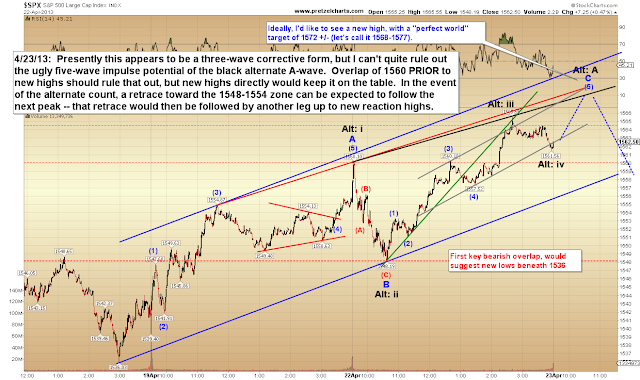 Corrective waves can be quite complex and thus extremely difficult to anticipate perfectly in advance. Beyond that, the "easiest" market reads are almost always done in real-time, since the market gives off new information by the minute. It's almost impossible to anticipate every potential turn which will come down the road in a given session (and even more impractical to try and outline them). But since a static published column obviously doesn't have the luxury of speaking in real-time, what I try to do is look several steps down the road to give readers some idea of what I'd watch during the session. Assumptions have to be made in order to do this, and the first assumption I'm making is that this is indeed a corrective rally, as opposed to a new impulse wave which will head to new highs. Accordingly, I've noted the two most likely possibilities for a corrective wave on the chart below. 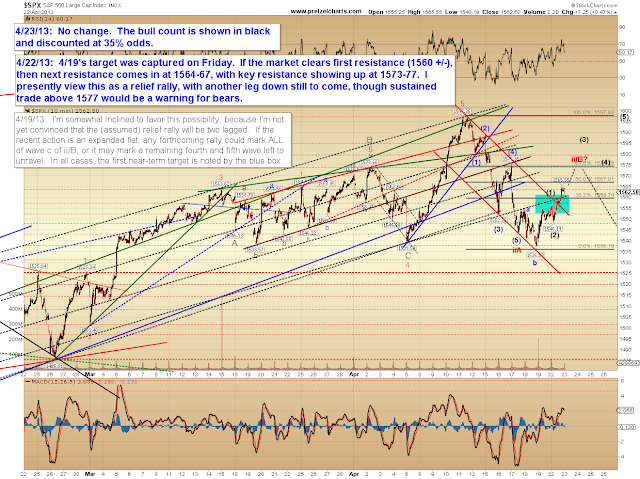 If the market sustains trade above 1577, then we'll have to look more seriously at other angles. In the event that my thesis of a corrective rally is wrong, on the 10-minute chart below, in black I have noted the rough turning points I'd watch for an impulsive rally. Again, presently the only invalidation level for a corrective wave is the prior high -- so all we can do is watch key resistance at 1577 for our first clue that something more bullish may be afoot. 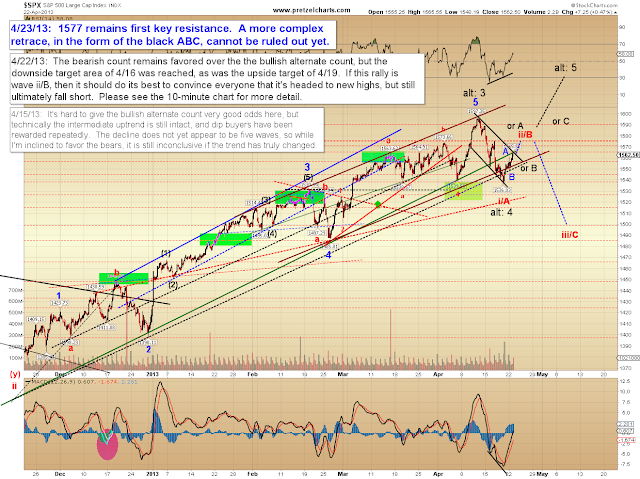 The hourly chart of the SPX builds on the one-minute chart and notes the rough turning points for the alternate ABC in black. In conclusion, the rally has shown no signs of abating yet, so all we can do is watch and see how the market responds to the next resistance levels. In my perfect world, I'd love to see this wave complete in the 1572 +/- zone and turn lower from there, but I'd have to see how it unfolds in real-time to have more confidence. It remains noteworthy that this rally was entirely anticipated -- so the rally in and of itself is so far not a reason to switch back to a more bullish intermediate stance. The market of course reserves the right to show enough strength to change my mind going forward, but presently I continue to feel this rally will ultimately be sold to new lows. Trade safe. Reprinted by permission. Copyright 2013 Minyanville Media, Inc.
articles. I'll bookmark your weblog and check again here regularly. I am quite certain I'll learn many new stuff right here!